This artist's illustration shows the Jupiter-size, extrasolar planet, called HD 209458b, orbiting close to its star. Starlight heats the planet's atmosphere, causing hot gas to escape into space. One of the biggest risk-takers inthe planet world orbits so close toits parent star that its upper atmosphere bleeds into space like high-speed steamrising from a boiler. 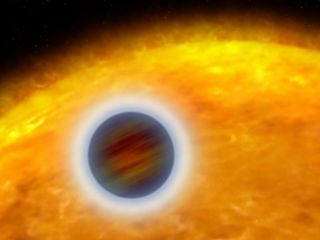 Now astronomers have measured the "layer-cake" structureof the extrasolar planet's heatedatmosphere. Like a freshly-made cotton candy, HD209458b is so hot that its atmosphere appears to be puffed up. The Jupiter-sizeplanet is just 4.4 million miles (7 million kilometers) from its star, or 20times closer than the Earth is to ourSun, and about 100 times closer than Jupiteris to our Sun, hence the nickname of "hot Jupiter" for extrasolar planets this big and close to their parentstars. The new study, detailed in the Feb.1 issue of the journal Nature, could shed light on other hot Jupiters. "This planet's extremeatmosphere could yield insights into the atmospheres of other hot Jupiters," said lead scientist Gilda Ballester of the Universityof Arizona in Tucson. With the HubbleSpace Telescope, astronomers measured starlight that filteredthrough the planet's puffyouter atmosphere. Astronomerscan calculate an atmosphere'sstructure and chemical make-up by studying how starlight filters through it. "The layer we studied isactually a transition zone where the temperature skyrockets from about 1,340degrees Fahrenheit (1,000 Kelvin) to about 25,540 degrees (15,000 Kelvin),which is hotter than the Sun," Ballester said. "With this detection we see the details of how a planet loses itsatmosphere." They observed that ultraviolet radiationfrom the hoststar bakes the hydrogen gas in the upper atmosphere [image],causing it to balloon. With such an intense heat source, the gas streams fromthe planet's gravitational pull at a rate of 10,000tons a second, or three times the rate of water flowing over Niagara Falls. Even still, astronomers don't expectthe planet to fade away any time soon. It has a prognosis of 5 billionyears or more. Discovered in 1999, HD209458b is one of a few known alien worlds that can beobserved as it transitsits parent star, called HD 209458. With a 3.5-day orbit, HD 209458b is 150light-years from Earth in the constellation Pegasus. Astronomers estimate about 10 to 15percent of the more than 200 known extrasolar planets are hot Jupiterslike HD209458b. A recent Hubble survey revealed 16 hot Jupiter candidates inour Milky Way Galaxy, which suggests there might be billions of these gassystar-huggers in our galaxy. Previous Hubble observationsrevealed oxygen, carbon, and sodium in HD209458b's atmosphere, as well as in its fan-like tail. Those findings combined with thenew onesprovide the first detection of the chemical makeup of an extrasolarplanet's atmosphere.